During his comments to the pro-government National Constituent Assembly Jan. 15, Maduro also ordered the attorney general to investigate the bishops for hate crimes. Maduro referred to comments made by the Bishop Victor Basabe of San Felipe and Archbishop Antonio Lopez Castillo of Barquisimeto. 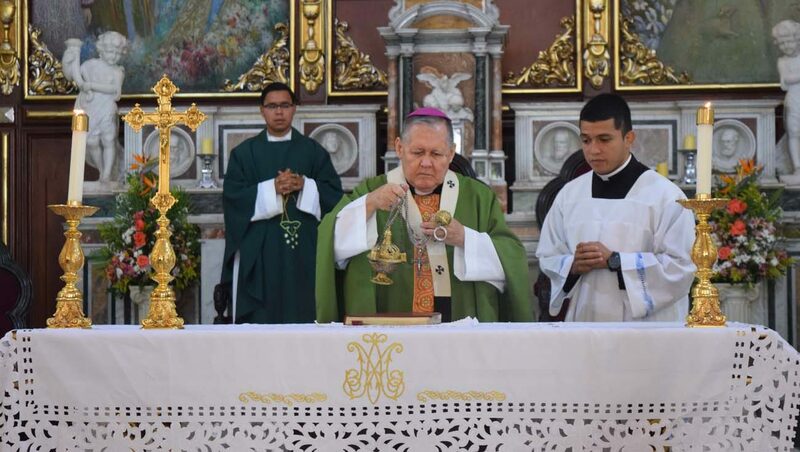 On Jan. 14, during the annual procession of the Divine Shepherdess, which attracts millions in the western city of Barquisimeto, both bishops spoke out against corruption, which they said has contributed to the country’s spiraling economic crisis. Speaking with Catholic News Service after Mass at Santa Rosa Church Jan. 28, Archbishop Lopez said he does not regret the comments. Venezuela continues to suffer a deep economic crisis that has resulted in surging levels of child malnutrition and shortages of affordable foods and medicines. Venezuela’s hate crime law, passed in November by the pro-government assembly, vaguely prohibits the dissemination of hateful messages. Opposition leaders and journalists have decried the move as an attempt to crack down on all dissent. “They want the church to stay quiet, but we only obey God,” Archbishop Lopez said. While the Venezuelan bishops’ conference and the socialist government have often clashed, the rhetoric has intensified since Vatican-sponsored talks between the government and opposition collapsed in early 2017. Church leaders have faced repercussions for their dissent, with pro-government gangs even crashing Sunday Masses, forcing churchgoers to listen to pro-government speeches and shouting insults at priests. Father Yanes regularly attended anti-government protests last year and even presided over the funeral Mass of several young protesters who died in the conflict. He also officiated the funeral of Oscar Perez, a former police agent turned rebel who attempted to initiate a rebellion against the government, stealing a government helicopter and flying over Caracas. The clashes between the church and government appear set to escalate further ahead of presidential elections, hastily announced by the pro-government assembly and set to take place before April 30. At the Jan. 28 Mass, churchgoers who spoke with Catholic News Service backed the bishops.